The weather is warming up, and pool season is upon us! This time of year we usually get a lot of calls about installing new, and replacing pool decks. We also get a lot of calls for “repair work” from old shoddy concrete work that has either is usually cracked, settled, does not drain properly, or is peeling/spalling. I would to go over a few scenarios and options addressing each of the scenarios above. New Concrete Pool Decks: I am not usually one to up-sell my customers, but when it comes to pool decks I think you should make sure to spend your money wisely and get as much concrete as your budget allows. Too many times home owners want to add just a few feet here and there to enhance their existing pool deck, and this not only can be a big expense to meet job minimum pricing but can also be unsightly and noticeably patchy due to the different colors and textures of new concrete vs older and worn concrete. Stamping is always an excellent option, not only because it makes the pool look more luxurious, but because it can be resealed as needed, making it look brand new forever! 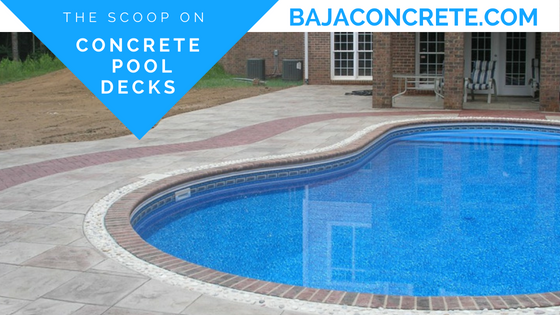 Replacing Concrete Pool Decks: This can be very tricky, and extremely costly if the contractor does not have experience at removing old concrete. There are usually many hidden obstacles underneath the concrete surface that the demo crew needs to be aware of. Plumbing and electrical wires, wire mesh, ground wires, footings, rebar, are just a few examples of what cannot be seen from the surface. Also, removing tens of thousands of pounds of material can get messy, and there are many hazards such as the pool equipment, the coping, landscaping, and whatever else may lie between the demo site and the dump truck or trailer. We have seen and dealt with it all, and are ready to tackle your job! If you don’t work with us, make sure you check your contractor’s insurance before doing the project or you may end up with a bombsite instead of a swimming pool! Repairs: Most companies that offer repairs do not put a warranty on their work. There are so many hidden and unknown factors that it is hard to offer a warranty on patch work in good faith. For this reason, Baja Concrete typically does not do repairs. We choose to do replacements with warranties. Changing the look of your pool area will bring much more value and pleasure to your house. Feel free to contact us and let us know what we can do in order to meet your concrete swimming pool deck needs today!! !